I’ve mentioned here a couple of times how over the last several months I’ve gotten hooked on The Dan Le Batard Show. It originates each weekday afternoon from Miami where they have an hour just for the locals, then three more hours syndicated nationally. The show was especially fun to follow during the latter half of the NBA regular season, playoffs, and the post-Finals drama involving LeBron James that ended with his decision to leave the Miami Heat after four years to return to play for the Cleveland Cavaliers. James, you’ll recall, made that announcement via a letter published in Sports Illustrated. The general response to the move was much more positive than had been the case four years ago when James decided to leave for Miami, with “The Decision” still earning him derision as a poorly-conceived bit of PR. Here, though, James saying “I’m coming home” played a lot more favorably among most observers (outside of Miami, anyway), and it does set up an intriguing storyline for the NBA next year. They’ve predictably spent a lot of time discussing both James’s departure and the future of the Heat on Le Batard’s show. Also capturing the attention of folks in Miami was how James conspicuously failed to thank the Heat fans in his letter. He refers to Miami as a “second home” and thanks his teammates and Miami management, but doesn’t specifically thank Heat fans. Today there is a big “Welcome Home LeBron” event happening in his hometown of Akron, Ohio. 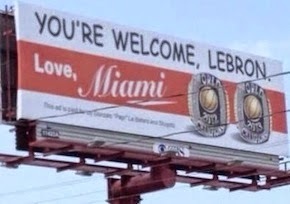 As a prank, the Le Batard show bought up several billboards telling James “You’re Welcome” from the Miami fans, humorously drawing attention to the omission in the letter. Regular listeners of the show knew all about the billboards as well as the fact that the show was readying a “multi-pronged attack” involving some more hijinks today. They also know that Le Batard himself is much more interested in having fun than anything else, and his buying up the billboards to deliver a message genuinely felt by some Miami fans was mainly just a goof to fill some downtime in the sports calendar (and drum up publicity for his show). The ESPN folks didn’t find the billboards as funny or harmless, though, actually suspending Le Batard and knocking his show off the air for two days in response. Saying the “stunt does not reflect ESPN’s standards and brand,” the network weirdly claims they “were not made aware of his plans in advance” despite the fact that the idea was discussed repeatedly on the show beforehand. ESPN’s reaction is silly, although it kind of helps promote even further that sense of “fun anarchy” surrounding the episode (to use Le Batard’s phrase describing the “stunt”). 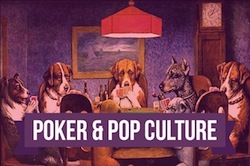 In any case, the story made me think about how sports fans relatively value humility and hubris, a topic that comes up in poker sometimes, too. The jokey, indirect complaint about James failing to thank the Heat fans, though, refers again to a lack of humility -- something most missed when reading the letter initially. We like competitors to express confidence, but I think we like hearing expressions of humility a lot more. Perhaps in poker it is different, where the element of luck is more conspicuous than in basketball or in other sports (where it exists, too), thus making it appear even more unseemly not to acknowledge that one isn’t actually invincible. In any case, will be interesting to hear Le Batard when he returns, including where he will position himself on the humility-to-hubris spectrum regarding ESPN’s humorless action. Wow, that seems really extreme suspending LeBatard for a couple of days. What he did was funny. Are they worried Lebron won't give interviews to ESPN this season? 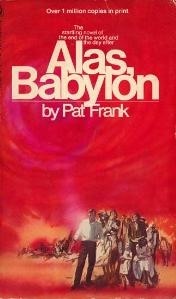 Not much of a chance of that happening. Stupidity be ESPN, to be sure.